And so began the FOMC’s countdown to the inflation blastoff since the end of the great recession. Our economy started with an unemployment rate as high as 10% in 2009 and negative Consumer Price Inflation (CPI). The Fed first warned us that an inexorable rise of inflation would start once the unemployment rate fell below 6.5%. However, the unemployment rate has dropped to 4.9% and the Fed is left starring at the heavens wondering why its 2% inflation target has yet to be reached. Now, from some truth about inflation. Inflation occurs when the market loses faith in the purchasing power of a currency, not from too many individuals becoming productive. In reality, there is no evidence that full employment is inflationary. In fact, the 1970’s stagflation struggles proved that unemployment and inflation could rise rapidly in tandem. And during the sub 4% unemployment rate during the turn of the century proved that an unprecedented amount of productive people could exist in a world of below 3% CPI. Despite overwhelming data to the contrary, the 255,000 increase in July jobs created is putting pressure on the FOMC to finally raise rates for the first time this year. But even a cursory look at the relationship between high CPI and a low unemployment rate since 1971 shows that none exists. But Yellen and company need look no further than Japan to see there is no correlation. Throughout the nation’s multiple lost decades marked by disinflation, Japan has always had an extremely low unemployment rate; averaging 2.73% since 1953, and hitting a high of just 5.6% in July of 2009. In June of this year, Japan’s jobless rate dipped to a twenty-year low of 3.1 percent. 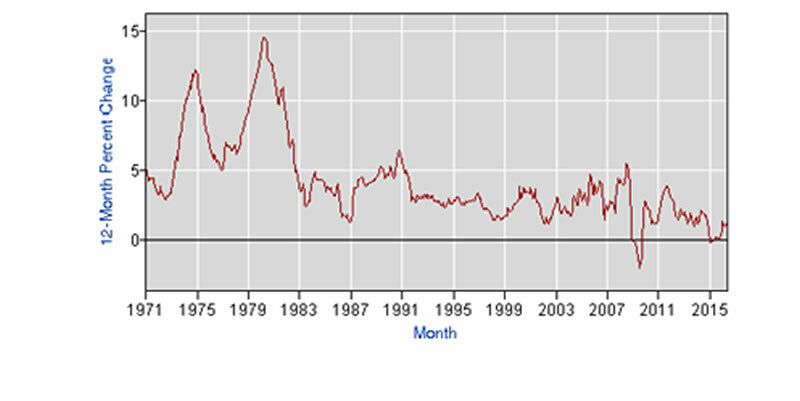 The number of employed increased by 720,000 year on year, to 64.97 million for the 19th straight rise. The number of unemployed dropped 140,000 on year to 2.1 million, for the 73rd consecutive fall. If Fed dogma were correct, these newly employed spenders would at the very give the Japanese inflation rate the jolt it needed to reach its long awaited 2% target. But Consumer prices in Japan dropped by 0.4 percent year-on-year in June of 2016, the 4th straight month of declines. And core consumer prices fell 0.5 percent from a year earlier in June, the steepest drop since March 2013. Household spending fell 2.2 percent in June from a year earlier, while industrial output slipped 1.9 percent on an annual basis. If full employment is the progenitor of inflation, why isn’t Japan breaking into hyperinflation? The truth is any inflation evident in today’s economy is not coming from a low unemployment rate, it originates from the record size of central bank balance sheets and the staggering increase in government debt that is being monetized. And that inflation is disproportionately being funneled into the bond and stock market, driving bond yields into negative territory and stock prices to all-time highs. In fact, the size of global central bank balance sheets has now risen to an astonishing 17.2 trillion dollars. But the Fed still feels compelled to worship its labor market dashboard; believing the inflation gods will be angered by the low unemployment rate. Therefore, the chances are increasing by the day that the yield curve will invert. This is because while Ms. Yellen is slowly and painfully hiking short-term rates (albeit for the wrong reason) the long end is being suppressed by the nearly $200 billion per month of QE from the developed world’s central bankers. Why is an inverted yield curve so important? An inverted yield curve cuts off bank lending and has precipitated the last 7 recessions 100% of the time. Only this go around, the yield curve will invert somewhere in the one percent area instead of the mid-single digits—so there isn’t much room at all for the Fed to widen spreads. Unfortunately, this is just one of the landmines placed by global central bankers that will explode with unprecedented ramifications. The other time bomb set to blow is runaway inflation coming from the collapse of faith in central bankers to retreat from the pace of fiat currency creation. And this will occur regardless of how many people the Fed has deemed worthy of earning a living.